Death to Junk Mail and Phone Books! Americans throw away 44 % of their junk mail and only half gets recycled! 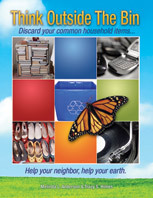 We pay $370 million each year to dispose of junk mail that is not recycled. 19 billion catalogs are mailed to U.S. households each year. On average, we spend 8 months over the course of our lives opening junk mail. This entry was posted in Junk mail, Paper, Think Outside The Bin and tagged get off mailing lists, junk mail, postaday2011, recycle phone books, reduce junk mail. Bookmark the permalink. 1 Response to Death to Junk Mail and Phone Books!